Blu-ray was declared the winning format last year when HD DVD threw in the towel. This victory came after major studios left the HD DVD camp and joined up with Blu-ray. But just because a victory was celebrated, that doesn’t mean the format is successful. In fact, a recent Harris Interactive poll shows that many purchased an HD DVD player last year and most don’t plan on buying a Blu-ray player anytime soon. This poll’s results might be shocking to some outside the tech community, but it clearly shows that consumers are ready to move past physical media and onto the digital downloads. In fact, secondary polls were conducted as well and found that an overwhelming number of people are “not at all likely” to purchase a Blu-ray device within the next year and many will buy fewer DVDs within six months. 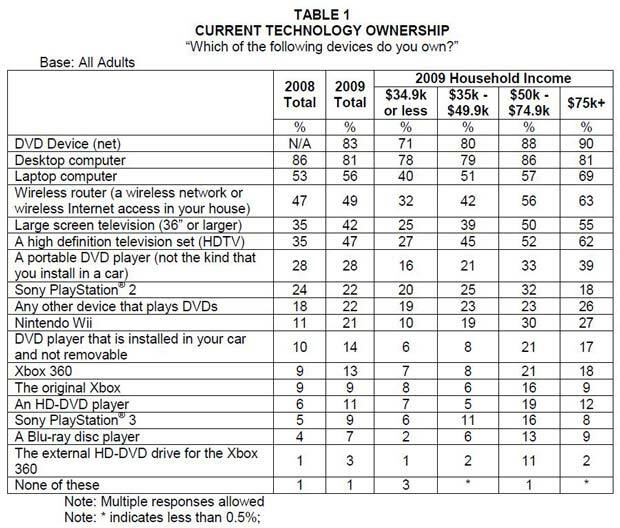 This Harris Interactive poll (PDF) found that 11% of Americans own an HD DVD player despite the format being officially dead. Plus another 3% have the HD DVD add-on for the Xbox 360. This is up over 2008’s findings of 6% and 1%, respectively. Blu-ray’s penetration also rose, albeit not as much, from 4% in 2008 to 7% in 2009. The same goes for the PS3 with 7% of Americans now owning Sony’s gaming system. But you thought HD DVD was dead? Well, it is. That doesn’t mean that consumers didn’t take advantage of the fire sales shortly after Blu-ray was declared the victor. Clearly consumers either aren’t aware of the benefits that Blu-ray provides, or they just aren’t interested in another physical media. Think about it: 20 years ago, VHS was introduced. People rushed out to buy up all their favorite movies on that format. Then DVD was introduced. That format touted superior picture quality and discs loaded with extra features. So then consumers bought up their must-have movies a second time and continued to grow their collections with new releases. But then another format was introduced: HD DVD. This time around, consumers heard the same marketing pitch: an even better picture and more extra features. Alright, some bought into that while Blu-ray slowly rolled out and crushed the first high-def optical media type. Many consumers sat on the sidelines as these two fought it out while a third player slowly crept onto the market: digital downloads. Comcast doesn’t get much love around these parts. We’ve all had major problems with the provider, but Comcast has made one of the biggest pushes for the digital download movement. Its On Demand is built-into all of its cable boxes and has shown to the general consumer that they don’t need physical media. Why do they need to run down to Best Buy on Tuesday to buy the latest releases, when the same titles are available via On Demand on the same day for a fraction of the price? Or, why worry about returning a movie to Blockbuster when they can watch it at their convenience? The second poll that Harris Interactive conducted found that 93% of consumers in 2009 are “somewhat/not at all likely” to buy a Blu-ray player. Last year, 91% of people said that. Plus, a third poll conducted found that consumers are only planning on buying 3.4 DVDs over the next six months versus the 6.2 that they purchased over the last six months. The economy cannot be blamed for this. Blu-ray players are now at the $100 mark, and DVD discs are cheap. Consumers are likely finding that physical media isn’t the future; digital downloads are. Even the video game industry is moving this way. 2009’s E3 featured two major players announcing their support for downloading games. The Xbox 360 is gaining this ability shortly via Xbox Live and the new PSP Go! doesn’t support physical media at all. All of its titles can be downloaded directly onto the device. Currently there isn’t a standard way of downloading or streaming movies. There are too many providers spanning too many devices. But things are slowly starting to change. Netflix made its way onto many devices last year and Vudu, one of our favorites, is starting to embed its software into set-top boxes. The music industry suffered a long, agonizing death because of its inability to change. Hopefully Hollywood took notes.